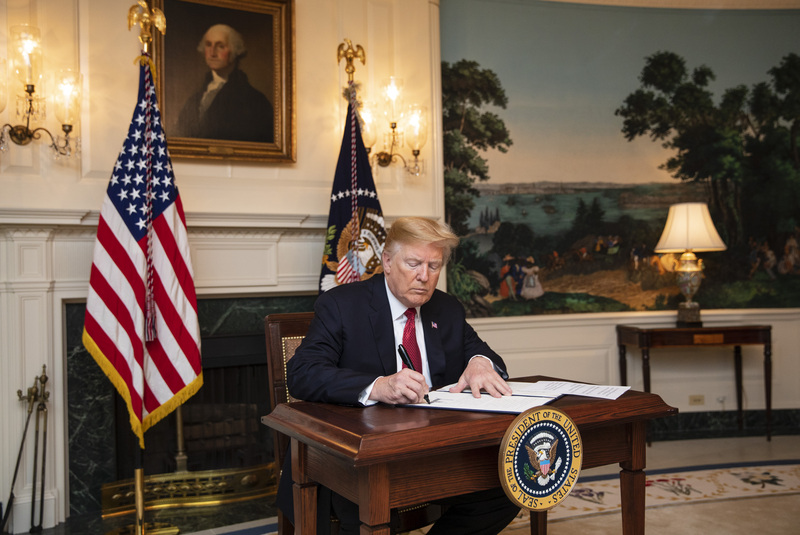 On October 20, President Donald Trump announced a plan for withdrawal of the United States from the Intermediate-Range Nuclear Forces Treaty, known as the INF. The Cold War-era arms control agreement was made in 1987 between the United States President Ronald Reagan and the Soviet leader Mikhail Gorbachev. Both powers agreed to eliminate – short and intermediate-range – conventional as well as nuclear missiles. The treaty marked the beginning of the end of the U.S-Soviet arms race that had defined much of the Cold War. The announcement took both domestic and international actors by surprise and has sparked a larger debate over the effectiveness of the treaty and its role in international relations today. Supporters of the treaty warn of the re-emergence of arms race reminiscent of the height of the Cold War. Critics have argued that the withdrawal is long overdue and that Russia had been violating the treaty for years. The United States and Russia have been spouting accusations of violation back and forth in the past decade, most notably in 2014 when the Obama Administration announced that Russia had been directly violating the treaty by developing a cruise missile. President Trump’s announcement only outlined a plan of withdrawal and does not mark the official collapse of the treaty just yet. First the United States must provide a formal notification of withdrawal to Russia, which Secretary of State John Bolton has asserted will be issued “in due course.” The United States will then have to wait six months to officially withdraw in accordance to the treaty provisions. Representatives from Moscow have warned that in the absence of such a treaty, the increased buildup of U.S nuclear weapons threatens international stability. The prospect of U.S withdrawal from the INF has also instigated questions on the malleability of the treaty, with it having been signed over 30 years ago in the context of the Cold War. Some have argued that the utility of the treaty has been compromised by the emergence of other threats more pressing than Russian missiles. China in particular has been pointed to as an increasing concern to U.S. security interests. Critics of the INF have argued that China, who is not involved in the treaty, is a more substantive threat to U.S. security interests than Russia. In recent years, Chinese expansionist measures, notably the build up of both their conventional military and nuclear weapons, has strained relations in the region. The Chinese PLA Rocket Force, or PLARF, has been implementing long-term modernization plans for its conventional and nuclear missile program. Some of these new missiles include the DF-26 missile that is capable of precise conventional or nuclear strikes that could reach Guam, including U.S. military bases there. In response, the U.S, has deployed destroyers to the South China Sea, a particular site of conflict. With inflammatory rhetoric surrounding economic disputes coming out of both Beijing and Washington, many fear the potential of a military confrontation. While such a conflict is still unlikely, some experts argue that the odds of a confrontation turning nuclear are higher than leaders would like to admit and as such, must be avoided at all costs. Those in favor of withdrawing from the treaty explain that the INF restricts the US ability to respond to a potential Chinese threat of military confrontation. The Chinese have often expressed an unwillingness to sign onto such an arms control agreement, which some argue demonstrates the shortcomings of treaties like the INF. The restriction of 1 or 2 international actors in an arms control agreement can be compromised by the emergence of a third party power not restrained by such provisions. Without the INF, U.S relations with both China and Russia will enter into unchartered territory. The powers will have to navigate arms control agreements, or the lack thereof, without the preliminary basis of the INF provisions. In the absence of the treaty, however, the US will have more autonomy in its response to Chinese aggression. Without the implementation of an arms control agreement, the most probable U.S. response to such Chinese military build up would be updating a strategy of deterrence. This response would involve an American transition from long range missiles to also short and intermediate range missiles that would be implemented in the region. This would constitute the development of such short and intermediate range missiles prohibited by the INF to remedy the current missile imbalance between the U.S and China. U.S relations with Russia will continue to deteriorate in the fallout of the treaty as well. For many in Washington, recent Russian investments in new nuclear weapons suited for limited nuclear warfare has been an increasing cause of concern. Further, communication between American and Russian leaders has been shrouded in a lack of transparency. This ambivalent nature of US-Russian relations has been further exacerbated by the surprise announcement of withdrawal and the failed Russian attempt to sway the U.S to remain in the treaty. Today, 90% of the 14,000 nuclear weapons in existence rest in the hands of either Russia or the United States. Proponents of the INF warn that without agreements to stabilize these nuclear weapons, countries run the risk of further fostering an environment of mistrust which could exasperate miscalculations that could end in disaster. This instability in U.S. Russian and Chinese relations call into question the credibility of nuclear deterrence today. Deterrence had been the cornerstone of U.S grand strategy throughout the Cold War and has continued to be, most distinctly through treaties such as the INF today. However, with the looming collapse of the INF, the effectiveness of deterrent strategies is being called into question. Nuclear deterrence is a strategy in which a country persuades an adversary against an action by threatening nuclear retaliation. It has been essential in avoiding conflicts from escalating to nuclear action. However, with the end of the Cold War, the strategy of deterrence as it was 30 years ago does not necessarily fit cleanly into the parameters of U.S. foreign policy today. During the Cold War, deterrence was necessary in countering the intense nuclear threat coming from the Soviet Union. Today, the scope of international nuclear warfare is changing with the emergence of new nuclear powers and shifts in Russian-U.S. relations. Contrary to Cold War dynamics in which stability between the U.S. and Russia promoted international stability, today just because Russia does not pose an immediate nuclear threat to the U.S. does not mean another power does not. Some argue that deterrence needs to be applied within the parameters of current security concerns. The increasing tensions between the U.S. and Russia, as well as the rise of other nuclear powers will need to be addressed via deterrence measures. Updated deterrence measures in the context of Chinese relations would help avoid potential military confrontations and preemptive wars that some policymakers have supported. Other critics argue that the very existence of nuclear weapons constitutes a level of risk, especially in a post-Cold War world. Proponents of the annihilation of all nuclear weapons argue that while deterrence was essential in preserving international security stability, reliance on such measures have become increasingly dangerous as more powers gain nuclear capabilities. They argue that deterrence works in a framework involving only a few powers. The involvement of multiple nuclear powers and the risk of non-state terrorist actors obtaining such weaponry as well, exasperates the complexity and heightens the dangers of deterrence. In addition to the increased number of nuclear powers, dangers of accidents, miscalculations, and blunders are all major concerns surrounding the existence of such weapons. Former Senator Sam Nunn and the co-chairman of the Nuclear Threat Initiative highlights that these same threats associated with nuclear weaponry that existed in the context of the Cold War remain pertinent today. He argues that treaties such as the INF are crucial in mitigating these risks through the physical destruction of such weapons. This is especially relevant in the context of 21st Century technological advances that compounds these known risks involved with such weapons with the threat of cyber attacks that could result in a calamitous miscommunication or the launch of a missile. Treaties like the INF do not necessarily rectify these dangers, but they do mitigate some of the risks that nuclear weapons entail. In addition to the destruction of intermediate range missiles, the INF had required the exchange of data, weapon inspections, and regular communication on the status of nuclear arsenals. Withdrawal from the agreements would result in less transparency on the state of U.S. and Russian nuclear programs at a time in which relations between the powers is becoming increasingly contentious. In an international climate defined by rising tensions and political provocations intended to push diplomatic boundaries, maintaining treaties is essential in fostering stability. However, in relations with states that have nuclear capabilities who are unwilling to sign onto arms control agreements such as China, the United States must adjust strategies of deterrence in order to respond to threats efficiently. This would include responding to Chinese military build-up by matching it. This could include supporting neighboring countries militarily and the fortification of U.S military resources in the area. President Trump’s plan to withdraw from the INF is arguably justified on the basis of Russian violations of the treaty and the growing Chinese threat. However despite such justification, many fear the absence of a treaty could mean the emergence of an arms race reminiscent of the Cold War. Some, including Gorbachev himself, have suggested revisiting the terms of the treaty. A possible revision could include exceptions to the buildup of prohibited weapons in response to threats from nuclear powers who have not signed on to any arms control agreements. This would certainly provide the U.S. more autonomy in addressing Chinese expansionism while preventing the re-emergence of a U.S.-Russian arms race. Whether the INF treaty will actually collapse, only time will tell. President Trump has threatened withdrawal from international agreements before, including NAFTA, without having actually followed though. Regardless of whether the treaty does collapse, international discourse surrounding the use of nuclear weapons has been drastically changed.